Greetings and salutations friends! 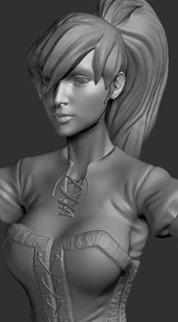 I hope you have been following our progress on the new 3D game project at www.Artix.com . If not, be sure to add it to your "list of pages to check" as I have been posting daily. Tomorrow at 5pm EST, players are goign to get their first glimpse at the 3D game's in-browser graphics, and even more importantly AQWorlds Members (and anyone who has supported our games in the past with an upgrade or membership) will be able to pre-register and reserve their character's name. BOOM! *blast* The Hoverbase is under attack! And when you learn that one of your closest companions has betrayed you, you’ll have to take matters into your own hands to keep the both the SkyGuard AND Lore safe from harm! What the Pirate says changes EVERYTHING! Get ready to go deep into the heart of the SkyPirate headquarters, where you’ll face bloodthirty pirates, the DreamWeaver’s most precious victims and a villain who will take everything you thought you knew about this saga and turn it upside down! Don't mess with the SkyGuard! But before you can learn about any of the shocking secrets and long-standing feuds, you'll have to go through the Chaorrupted SkyPirate General! You'll want to do more than just SWAT at the boss. Take him DOWN! The long-awaited Member-only SkyGuard Grenadier Class is LIVE! This class will ONLY be available to members. This week you can obtain it if you have rank 10 Skyguard rep, but if you want a shortcut AND you're a member, then NEXT week you can purchase it at Itzachi for 2,000 ACs! Check Cysero's Design Notes post for an in-depth look at the Grenadier Class skills! 3-way Etherstorm War! Fight for Good, Evil, or Desoloth! His fate depends on your fighting! The Return of Xan – are you ready for things to get HOT?! Lucky Week minigame fun fair! Do YOU feel LUK-y? The Potionmaker takes up a sword and becomes the Battle-ready PoisonMistress! Have a good week, everyone! We hope members enjoy this Member-only Explosion week! All member-content, all week long! 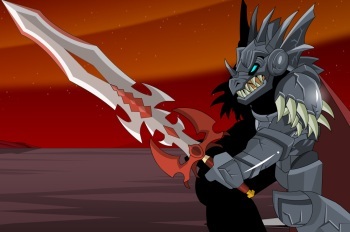 And get ready next week for the 3-way Etherstorm War and Dage the Evil's Even-Eviller Birthday Shop! Later today we will be releasing the Member Only Skyguard Grenadier Class along with the new addition to the Skyguard storyline. Before we get to the skills breakdown let me remind you of a few things. The Member Only Skyguard Grenadier Class is, you guessed it, for Members only. TODAY people who have already worked to get their Skyguard Rep up to Rank 10 will get a full week to preview of the class and master its skills. Now that that's out of the way, let's get crackin'. Many people don't know what a Grenadier is. Long ago, just after the development of the first hand-thrown explosives, they were bravest and physically strongest soldiers. They'd have to be brave to walk around lobbing explosives that could blow you to bits and they had to be strong so thew could toss them as far as possible. This combo of traits meant that every Grenadier was half fearless and half insane. As the technology of warfare developed, grenade launchers were invented so you no longer needed to be the strongest but you still had to have that special mixture of courage and madness that makes the grenadier so unique. The Skyguard Flightpack is not part of the set. They are often chosen to lead special assault teams and used as shock troops. Each Grenadier is worth a whole squadron of less specialized soldiers. WARRIOR is the enhancement that you want to use for this class. It's also built on the Warrior mana regen model so you get mana from both hitting and getting hit. The interesting thing about this is that each skill is a different grenade and each applies its own state to your foe, but the last skill applies a secondary effect based on which state you have applies to the enemy. Here is your basic attack. Nothing flashy but it gets the job done. Light damage, lowers enemy damage output for 4 seconds plus applies Weakened State. Weakened State replaces any other state. This is the first skill that you get. It's the cheapest and has the fastest cooldown but also the weakest. The debuff is nice but once the last skill applies the secondary effect this skill gets nicer. I know that it;s hard to hamstring someone with a grenade but somehow you manage to do it. You're that good. Moderate damage, reduces enemy chance to hit plus applies Blinded State to enemy. Blinded State replaces any other state. Twice as costly as the first grenade and with twice the cooldown time. Again, another nice debuff but again it's the secondary skill that makes Flashbang a sweet skill. Moderate damage up to two enemies, reduces enemy haste and has a chance to stun for 4 seconds, plus applies Gassed State to enemy. Gassed State replaces any other state. Again, this grenade has a longer cooldown than the two before it but has multiple effects even before you use the last skill. It's a multi-hit attack with moderate damage, reduces enemy haste on both targets and COULD stun both targets. Decent Rank 4 passives. Increase survivability a LOT and do more damage. What's not to love? High Damage, plus has secondary effect based on whichever State was last applied to your foe. Weakened State secondary effect – Bleed causing Damage Over Time to enemy. Blinded State secondary effect – Rally causing Heal Over Time to to you. Gassed State secondary effect – Elude causing increased Damage Resistance to you. Secondary Effects all last 6 seconds. Ok, there is a lot going on here so let's take it one step at a time. Each of the 3 earlier grenade skills apply a State. Weakened, Blinded and Gassed. In addition to doing High Damage, this will add a secondary effect based on which state you have applied. If your enemy has the Weakened State applied, then this skill will do High Damage and cause BLEED which is a fairly strong Damage Over Time (DoT) to the target. If your enemy has the Blinded State applied, then this skill will do High Damage and apply RALLY to you, which is a VERY strong Heal Over Time (HoT). This is a great heal, and one of the strongest HoTs in the game. If your enemy has the Gassed State applied, then this skill will do High Damage and apply ELUDE to you, which is a decent Damage Reduction buff. Rarely, you see your chance to turn the battle in your favor. You give this attack everything you've got causing VERY HIGH damage to up to 2 targets! You've seen this type of passive before, but this one causes HIGH DAMAGE to up to 2 targets. If you're fighting a boss then it will just be a nice chunk of extra damage, but if you're farming then BOOM, you just cleared the field. Keep your eyes here on the Design Notes for more notes on today's release! The New Member Only Mini-Storyline In Bludrut Keep Is Here! Sorry for the one day (and 1.5 hour) Delay but the Mid-Week is here as promised. Head to Bludrut and speak to Veddrian the SpiritHunter. Help her solve the mystery of her forgotten past and why she keeps dreaming of herself as a child and you will unlock the SpiritHunter Shop where you can earn your OWN SpiritHunter Gear. This has to be my favorite Mid-Week release so far in terms of story. It was fun to tell but took 4 Cutscenes which is rather a lot for a mini-release but I wanted to do the story justice. Oh yeah, you'll want to turn your speakers up for this one. 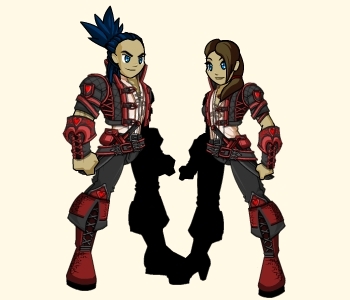 Thanks for being patient with us, have fun and come back tomorrow for the Skyguard Release and the first appearance of the Skyguard Class, Grenadier (skills write up in tomorrow's DNs)! Sorry guys, I've been a little busier than usual this week with both Ae stuff and real-life stuff so I'm sorry to admit that the Mid-Week Blutrut Mini-storyline will be coming tomorrow instead of today. I'd rather give you a well put together and tested mid-week than try and push through and give you something slapped together four hours late anyway. It's already 2:15 and I still have too much work to do to reasonably get done by the end of today, there is still a lot of database work to get done, special functionality for the quests, Cutscenes to animate and I have to replace all the ancient pop-ups in Bludrut with our standard ones plus a bunch of other stuff that you really probably don't want to hear about. To give you a heads up, this week's mid week will introduce Veddrian, the SpiritHunter. She has trained her whole life to either destroy hateful spirits who wish to harm the living or help them move on to the next world. Recently, though, she has been having bad dreams of herself as a little girl in the halls of Bludrut near where her adopted family found her. ... which will, as always, be unlocked when you finish the mini-story and are, as always, Member only. If you can't trust your family, who CAN you trust? Drip... drip... drip... Rusty brown water drips from holes in the corrugated metal ceiling of the crumbling bunker in the SkyPirate Base where the children are kept. The thin, unceasing sound drills into her ears and would eat away at her resistance if she didn't keep singing loud enough to drive it away, Nhia thinks to herself. And besides, it helps Jarren stay strong, too. And she would do anything to protect her little brother. Especially after the last blow from the Pirate as he brought in their breakfast. She can still see the bruise staining Jarren's cheek, spreading and growing darker as the morning passes. He didn't cry when the cuff came, and he didn't fight back. It's too fine a line, she thinks, between not showing fear and not showing defiance. She doesn't know how long they can keep treading it. "Nhia? Nhia? Nhia Nhia Nhia!" Jarren rapidly tugs at her ragged hem from where he crouches by the bin. "What, Jarren? What do you WANT?" Nhia snaps, immediately regretting the harsh tone as tears well up in his eyes. What the Pirates couldn't do to him, she has, and she promises silently - again - to do better by him. To get them both out of this place. "When ith Gramma goin' to tell the Pirates to let uth go? I dreamed of her latht night again. She wath holdin' me and thingin' to me like a Gramma thould do." Jarren's lisp only comes out when he's confused or scared, she knows. Nhia pulls him to her and hugs him tight. If their own mother is too afraid to protect them from the DreamWeaver - she refuses to call her Grandmother - then she'll have to do it herself. But maybe... last night's Dream comes back to her in a rush. "The DreamWeaver never held you like that, Jarren. She only makes you think she has. You've got to stop believing in her! We are nothing to her but tools to use, garbage to give to those filthy Pirates to make them think she'll keep her word." Her voice is harsh again, and she fights to soften her tone. "We won't be here forever. I can feel it, and I Dreamed it. Something is going to change, someone is going to come, and it's going to be soon. We can hold on, Jarren. We have to." Nhia draws a deep breath and finishes. "Dream of tomorrow's tomorrow. Hold the picture in your mind like Momma showed us. We can make help come. This nightmare has to end sometime!" Our first winner was given a full week to respond to the e-mail that we sent them and I'm sorry to say that they have missed out. I think a week is a very reasonable amount of time to give someone to respond but a lot of you want to get this show on the road and so do we. We have sent a NEW e-mail to the NEW winner, so be sure to check the e-mail that you have attached to your account. If you, for some reason, can no longer access that e-mail then contact your e-mail provider and try to get access again. Again, contact your E-MAIL provider. Player Support can't help you get your e-mail back. Nythera and her crew have many wonderful powers but all of them are related to AE's games and go no further into the real world. We will be giving this new winner 3 full days to respond. Winner, if you have not responded by Thursday at NOON (server time) then we will pick again. Good luck, and hurry up! Everyone is waiting on you! Over the weekend we saw a lot of chatter about the new legion quests. TO ME it seemed pretty even, half of you were complaining that the quests were too easy and half were complaining that they were too hard. That usually indicates that we did well but Dage was unhappy with how easy these new quests seemed to be and they are his quests so he can make them as hard as he likes. Today there will be some changes to the new quests. First, the Legion Soul Collector will be raised in price to 150 Legion Tokens. Second, each of the subsequent quests will require 50 souls instead of 25. To those of you who got it before the changes went through, well done. It takes a keen eye to appreciate a bargain when you see it. Big MEMBER week this week. Wednesday will have another Mid-Week release for members which will add a little more story to the Bludrut map plus some nice new member rewards. Friday will see the next installment of the SKYGUARD storyline as well as the premier of the Member-Only Grenadier class! MANY of you Members have already reached rank 10 in Skyguard and have been waiting for this class for a long time. You will all get a head start on this awesome new class as you will only be able to get it with reputation starting this Friday (Feb 24th). Next Friday (Mar 3rd) an AC version of the class (Which will also require Membership) will show up Itzachi but by then the hard-grinding Rep hunters will already have mastered the class all the way to rank 10. I know that some of you will take issue with the class not being rep only but we are doing this because a LOT of people like taking the AC shortcut and it doesn't seem right offering the time-saving shortcut to non-members but not for Member classes. Any ways to save time and/or labor should always be available to Members. Those of you who wish to earn it without spending a single AC will, of course, always be able to take the path of hard work. Any additional items to the set (helms, weapons etc) will also be in the Skyguard Rep shop for Rank 10 and you will ONLY be able to get them through hard work. I will be doing a class skills breakdown a little later this week. In case you didn't notice, we have a new shirt in HeroMart for fans of Classic AQ! The "I'M ON A BOAT" shirt features AQ Classic's Death on his gondola welcoming you to the underworld. It also comes with the VERY LARGE Death's Reaver scythe for your AQ Classic character! We are running out of stock of MOD packs for the Battleon Battle Card game and we still have some 2012 Calendars but none of these items will last forever and once they are gone, we don't plan on reprinting them. You may or may not be a calendar person but I can't tell you how much I love having my mods packs as a part of my card game. Quibble and the Event Rare Shop for Love's Curse will be leaving a little later today! Just throwing that out there. This year is a Leap year which means that this month gets a 29th day this year (as it does every 4th year). It's a little late to do an entire event for Leap Day but what would you like to see happen on Leap Day? We might take one of your ideas and run with it. Something's Fishy in this Release! Grab your tacklebox and /equip your wading boots, because Fishing has come to AQWorlds! With 30 ranks to cast, catch and explode through, you'll find yourself rising from Fishmonger to Squid Kid all the way to the level 30 King Fisher in no time! You'll have to fight to reel in the best catch! 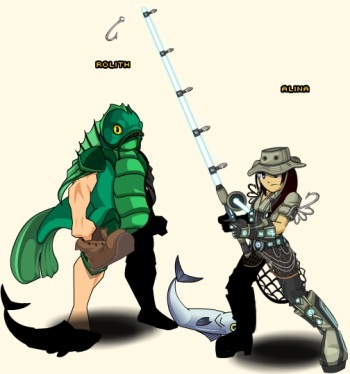 With rewards ranging from the Mystic Fishstick Staff to the Runed Master Angler armor, if you have the skills to wrangle your fishing rod well, you'll be swimming in fantastically finned gear! (And you can bet none of the rewards will be carp-y! Ok... all except the Fish Armor.) AND you'll get 80 free ACs worth of Fishing Dynamite, so you can make your OWN Fish Rain! Cannibalism?! You (Loch Ness) MONSTER! We're hoping to reel you in hook, line and sinker with this first tradeskill, because it's the first of a series we want to introduce throughout 2012! Dance to the Carnaval Music! Carnaval is here, so get your rear in gear and /dance the night away! 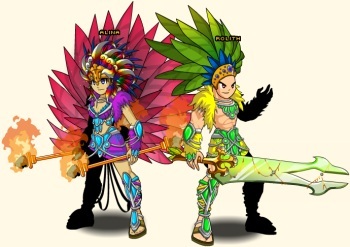 Samba's in Battleon with a bounty of beautifully, birhgtly-plumed armors, helms, capes, a pet and weapons to equip! And for those of you who feel like getting into the "bloco das piranhas" spirit, get your role-reversal armor by joining the /love map! Vai-Vai Carnaval Armor and Headdress! Capoiera Capybara Member-only BATTLE PET! Jungle, Ivory and Carnaval Headdresses 12! Carnaval of Love Armor 12! Pink Carnaval Feather Cape 12! 2 new emotes added for Members! HEY MEMBERS! We've got a small but emote-ional bonus for you today: the /useweapon brings back the classic /use emote that we removed so long ago, and /danceweapon will let you /dance your way through the battlefield! 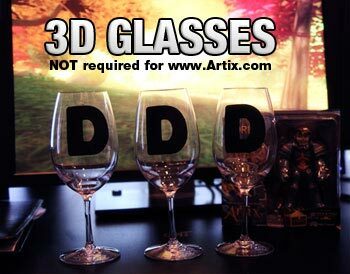 As we noted here at Artix.com (the AQ3D Design Notes page), the name pre-registration for ANYONE who has ever supported Artix Entertainment's games. * Pre-Reg moved to NEXT week! Keep up to date and find out all the latest news on our first foray into the third dimension in gaming at Artix's AQ3D Design Notes! *HeroMart items do not count, sorry! We can only track game/secondary currency upgrades in relation to your game account. Member Bonuses for AC Packages! 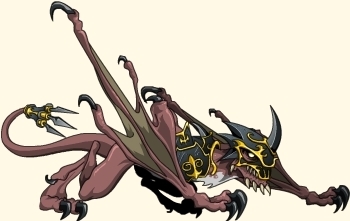 2k AC package: the Battle Wyvern BATTLE PET! 5k AC package: color custom Dreadnought Armor! 12k AC package: Mindbreaker Class! and Mindbreaker Class (12k AC package)! HOW DO I GET THIS GEAR? You can get all of this EPIC gear from the badge shops in the AE section of your Book of Lore! Mia J. Park Music for You! She was getting a lot of requests from you guys for her song "One Way Ticket" that she wrote specially for our event, so she put a free link to it on her website! Why not wander your way through the interweb to check it out? While you're there, why not listen to all the rest of her awesome music! SkyGuard Saga - Invade the SkyPirate Base! Desoloth Confrontation - War in Etherstorm! Return of the Xan Saga and the rise of the Battle PoisonMistress! We Got Yer Updates, RIGHT HERE! Power Week is continuing here at AE's Secret Underground Lab at lightspeed! I wanted to keep you guys in-the-know so here are some updates about the pile of stuff that is coming at you! AQ3D Name Camping TONIGHT SOON! 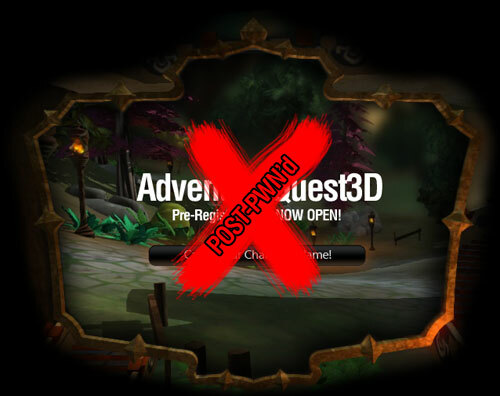 UPDATE: There are SIGNIFICANT bugs that were just discovered in last minute testing (of course) which means that we will need to POSTPONE AQ3D Name Pre-registration until they have been sorted out. Sorry for the falst start. AE's 3D game project will be opening its servers soon to past and present AQW Members (as well as Dragonlords, Star Captains, Guardians, HeroSmash Members, etc) as well as anyone who has ever supported AE with ACs, SmashCoins, Varium etc. Basicly ANYONE who has every purchased ANYTHING and helped keep us going can get their name! 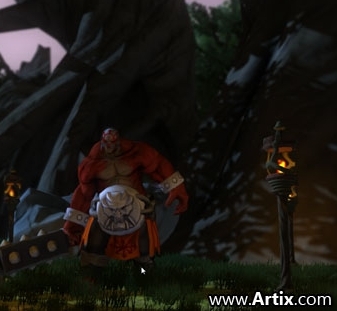 Once things get rolling you will need to go to ARTIX.COM to pre-register your character name. This will give you the chance to get your name before anyone else. Don't bother trying to take our names (Artix, Cysero, Alina, etc) We've already taken them. This is NOT Alpha Testing, this is JUST CHARACTER NAME RESERVATION! There might be some new stuff to see but there will be no game to play just yet. You won't be able to reserve your name unless you have a MASTER ACCOUNT set up on the AE PORTAL SITE! You won't be able to reserve your name unless you have your ACCOUNT LINKED TO YOUR MASTER ACCOUNT! I imagine it's going to be CRAZY then the servers do eventually open with everyone trying to cram into the servers all at once so good luck! Keep your eyes on ARTIX.COM and our Twitter feeds to know when the floodgates open! but only if you meet the criteria listed above. FISHING is coming tomorrow. We are busy adding lots of amazing gear and at least 2 achievements to this trade skill. It really is a lot of fun! FAITH has changed her hair color but she is still waiting to sell you bait, fishing poles and TNT as well as give you lots of advice about becoming a better angler! As my grandmother always said... "There is nothing quite as satisfying as tossing a lit barrel of explosives into a cool, calm pond and wathcing it rain fish!" 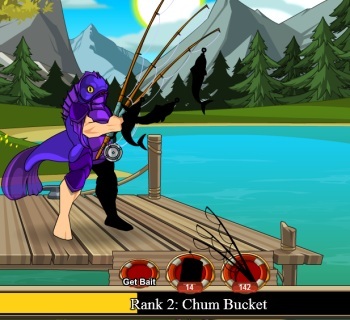 Remember that this is only the first of AQW's trade skills and will have many uses in the future but this week it will just be a very fun and very deep fishing system. Tomorrow we will be releasing the Member Bonus additions to the three standard AC packages. People still seem a little confused about them so I'll address a few questions here. Are the Member Bonus Items Member Only? Yes. I would think that one could have gone without saying but it turns out that it's still one of my top 10 questions about the items. Do the AC Packages Stack, IE. If I buy six 2000 AC packages do I get the 12,000 AC Class? No, the packages are seperate and do not stack. Each package unlocks it's own item or items. If you get the 12,000 AC package then you only unlock the 12,000 AC Badge, Shop and Class Set. Can I Use Artix Points to buy the AC Packages through the Portal Site? Yes you can. It calls the same function in the payment flow so no matter how you buy your 2000, 5000 and/or 12,000 AC Package, it will unlock the Member Bonus Items for you. Is there anything for the 1000 AC package on the Portal Site? Sorry, but no. 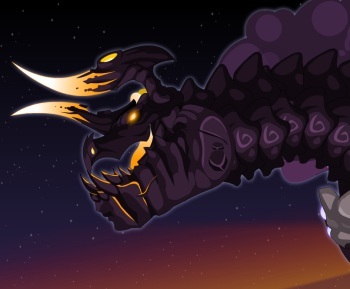 These were added to the packages that are availible through AQW's payment page. Since there is no 1000 package there, there is no Member Bonus for that package. When I got my Membership I also got the 5000 extra ACs for 5$, Do I get the 5000 AC CC Armor? No, the Member Bonus Items are only being added to the three stand-alone AC packages. Getting 20$ worth of ACs for 5$ is pretty great on its own! Do I have to buy them after Friday? No, we are also reaching back to Jan 1st 2012. If you have purchased an AC Package in 2012, then you have already unlocked that bonus shop! We were only going back 6 weeks but decided to take it all the way back to the start of this year. Are these going rare? Nope, they are staying as Member Bonuses in-game for the life of the game. How do I get my Member Bonus Items? After you purchase the 2000, 5000 or 12,000 AC package, the next time you log in you will see a new badge in the AE Tab of you Book of Lore! Click the badge, open the shop that appears on the page and get your Bonus Items! 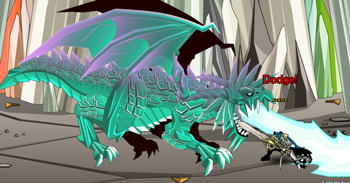 The 2000 AC Package comes with the Member Only Battle Wyvern Battle Pet. This pet works for anyone but if you have a Pet Class equipped it will attack for you! The 5000 AC Package comes with the totally Color Custom Member Only Dreadnought Armor Set! Every piece of this unstoppable from the plate to the trim to the glow on the ram horns on the helm is color custom. the 12,000 AC Package comes with the Member Only Mindbreaker Class Set. You have spent years training your body to be a fighting machine but you have ALSO honed your psychic abilities to work in unision with your weapons to create the ultimate psionic warrior! Many of you have been asking about the class's powers so I've done a skills breakdown for you. This is a very good, very strong, multi-purpose class with a few single target atttacks and debuffs, a few multi-attack AoEs for farming and a decent heal to keep you going. It's not bad in PvP either. This class seems to come down to mana management. Althought it is a magic based psychic warrior (which means WIZARD ENH fit it best), it's built on the Warrior mana-regen model which means you get mana for every hit you deliver or every hit you take. Using your mind, you reach out and cause pain to your foe. 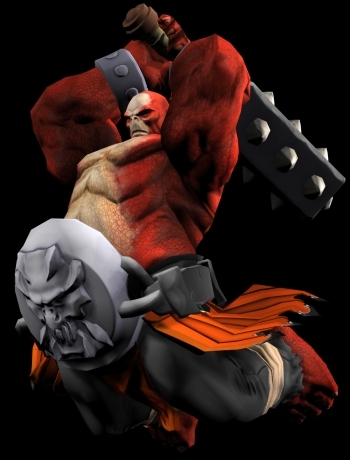 This is the Mindbreaker's basic attack. This is Mindbreaker's Auto Attack but we this is the first time that we have added a seperate animation to the auto attack. You appear to focus for a moment and send a blast of mental energy at your target. This is roughly the same amount of animation as swinging your weapon for an auto attack so should not cause any frame rate drop (lag) and might even be better depending on your weapon. A psychic fire engulfs your foe dealing light damage and applies Brain Fog reducing Haste and Hit by 3%, stacking up to 5 times and lasting 10 seconds. This is a decent single target attack and reducing both your target's Haste and Hit up to 15% will keep them nice and slow and keep them missing a lot more than they should. I imagine Brain Fog is like giving your enemy a mirgane that gets worse with each stack and if you have ever tried to do ANYTHING with that kind of headache then you know it can really slow you down and keep you off target. You send out waves of psychic energy dealing moderate damage to one or two enemies near you. This is a very basic AoE. It will only attack up to two targets at once so you shouldn't get overwhealned by tons of monsters as you fight. Its power remains constant and has no draw drawbacks. Just a good solid AoE. This is another of the new skill animations that we added just for Mindbreaker. Waves of psychic energy flow out of you hitting everything near you. This new effect is also applied during MB's last activatable skill, Esper's Might. Makes me want to yell "KANEDAAAAA!" when I use it. If you don't get that, shame on you. You lash out with a mental spear, striking your foe for damage based on stacks of Brain Fog also healing yourself for half the difference between your max HP and your current HP. A very useful attack and pretty cheap heal. The attack gets stronger the more stacks of Brain Fog you have on your target and it always heals for you half of what you're missing. If you're at 50% HP, it heals you up to 75%. If you are at 90% HP, it takes you up to 95%, if you are at 1% it takes you up to 50.5%. It's a little deceptive because it will never FULLY heal you but if you're smart and manage your mana well then you will also never die. Pretty basic Rank 4 passives. You crit more often and get a generous damage buff out of these skills. A powerful psychic burst AoE which will hit one or two foes. Damage increases based on stacks of Brain Fog as well as greatly reducing your enemies damage output for a short time. A stronger AoE than Psychic Wave, and can become fairly devestating with 5 stacks of Brain Fog up. Note that none of the skills consume those stacks so the only way you get weaker is if you let the Brain Fog expire. This is a very useful skill that can be used at its base level when farming (since most monsters won't last long enough to get 5 stacks of Brain Fog) or can be used in its powered up state against boss monsters or other players in PvP. The debuff is really the key. With the Haste and Hit debuff from Mindfire and the Damage debuff from this skill your enemy is reduced to little more than an angry kitten or slightly stale english muffin. When you are at risk of being defeated your amazing mind will occasionally construct an invisible psychic shield around you blocking all incoming damage for 5 seconds. A new twist on the rank 10 passive to increase survivability. It is basicly a random "OH $#!%, I'M GONNA DIE!" power. Due to its very specific set of circumstances, it goes off a lot more often than the average rank 10 passive but you probably won't notice that because by the time you're that low you'll be spamming your heal power. BUT when you're low on mana and waiting to get enough for a heal... you'll be glad it's there. While I was in the engine adding the new psychic animations I also added one for the upcoming Member Only Grenadier Class (Skyguard, Rank 10) and added two highly requested emotes for Members. /useweapon and /danceweapon. Long and long and long ago when you called the /use or /dance emotes you would have your weapon in your hand. A lot of players hated this and requested that we remove the weapon. We did as they asked but suddenly a whole different crop of players were demaning that we add it back. Having just removed it and quieted the first group, we didn't want to add it back. So finally you will be able to decide to either /use or /useweapon, and /dance or /danceweapon but the weapon versions are only for Members. it's not a HUGE perk but more specialized Member emotes is always good. I have been learning more and more about Carnaval in Brazil since we announced our Carnaval Shop coming Friday... like a tradition called "bloco das piranhas" where dudes put on skirts and wigs and pretend to be beautiful ladies. The results are often nightmarish but pretty hilarious. In OUR Shop we will have colorful armors, bongos, flamedancer torches, crazy masks and the world's largest and most dangerous martial arts rodent, the Capoeira Capybara Member Only Battle Pet. Lastly, I'd like to address some rumors that have been floating around about Nulgath. Sadly, some of the rumors are true. He HAS put aside his work on AQW to go build his own game under the EBILCORP corperate umbrella. He will NOT (cannot) delete his area and remove all of his stuff from the game. AE owns the rights to that game content and we are keeping it in the game. Finally, YES... his game looks pretty rad. More Mia J Park Music For You! From Artix - "Mia was getting a lot of requests from players for her song "One Way Ticket" that she wrote just for the AQWorlds event. So she put a link to it, for free, on the *coughs* You know, I never feel bad about plugging her music... we should just rename the the company to Mia Entertainment and make all game upgrades just buying her CD... of course... more than 30 of you would have to buy her CD for this to work!" This new... and unusual Valentines event is LIVE! There is a story behind tonight's special release. When I announced that I was going to write a love story, Alina started chuckling. She did not seem to think love fit into my normal writing style of ghouls, vampires, undead and monsters. After a few months, and a dozen scrapped stories... I thought she might have been correct. But I was sitting with Galanoth and Aresion one night when a concept that HAD TO BE DONE appeared. I took it seriously. I wanted to change the ending of something that always weighed heavily upon me. I know that it will meet mixed reaction... so it will be up to you do decide if this was crazy or clever. Regardless, I really do hope you enjoy it -- it is not your normal "pink with hearts and filly lace"-type Valentines event! Bug fix: If you are having a problem completing the quests, try going to /join lovescurse and watching the last cutscene again. As posted far below... I found Mia's music on YouTube completely by chance. Her voice was so beautiful that I was shocked when I noticed it only had 100 views! She is a new, indie artist from Australia with only a few fans and immense passion for her music. So I asked you and the other awesome players to give her a hand with that. Thank you, because that same video now has over 31,600 views! When I asked her if she would like to become part of this year's Valentines release, she graciously accepted. She even wrote a special song, "One way ticket" for it. Like many of you, this is not the type of music I normally listen to. But there is something about her deep, beautiful songs that touches my heart. 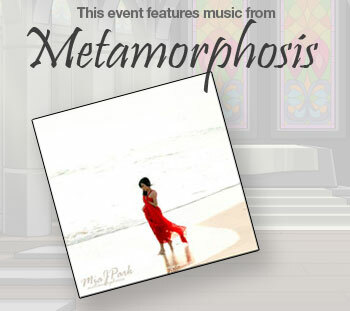 So I actually bought her debut CD "Metamorphosis" and have become a serious fan. I hope that listening to the music in the event causes you to do the same. I remember what it is like starting to follow your dreams. So, I am throwing my full support behind Mia, and hope you will support her also by buying one of her CDs. 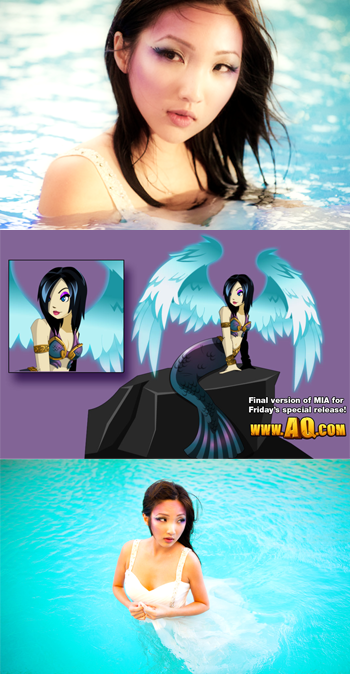 Mia surprised me by sending me a link to a special page for AQWorlds players. She made her album available to you guys for 20% off until the end of the month as a thank you for having her in the event. This was unexpected, generous, and a very classy thing to do. This was one of the craziest release days in the history of AE. I would love to know what you thought of the event, and the other announcements. I will be watching Twitter all weekend via my phone... please let me know if you liked it. Battle on! P.S. 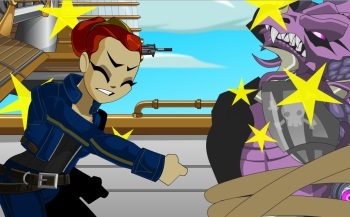 I would like to make a special thank you to Alina, who gave me a warm smile and thumbs up on my script (and fixed A LOT of typos O_O) then lead the AQW team to actually create this event. She is the best. Love is in the Air... and In-Game! Today we'll be releasing Artix's love story - "Love's Eternal Curse"! It's filled with comi-tragedy, epic battling, new faces and old... and an ending which will take a long-standing tradition and give it a new lease on life.... and love! Are you ready for a HEART-y helping of event rares? There'll be an event rare shop featuring both Player Suggestions and art by the AQW team's artists! It will be stocked with AC items, member-only items, and we think you'll LOVE what you see! (And they won't break your heart... or your bank!) Free-player gold items will drop from the monsters and repeatable quests! And if you're missing your favorite Hero's Heart Day releases from previous years, never fear! We'll be releasing all of those on Tuesday, February 14th! 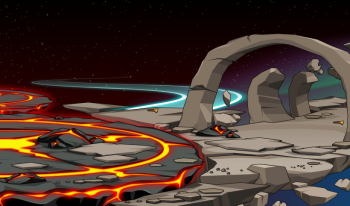 Quibble Coinbiter's shop in Battleon will get some fresh, rockin' new gear today, as well, so be sure to check his shop! 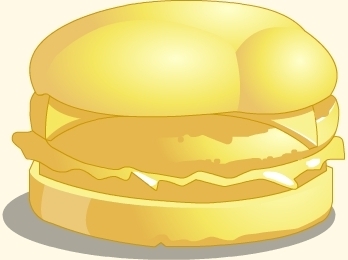 And don't forget to grab your Golden Cheezburger from Cleric Joy, the 3rd I Can Has Mod contest is almost over... who will get their wish granted THIS time?! 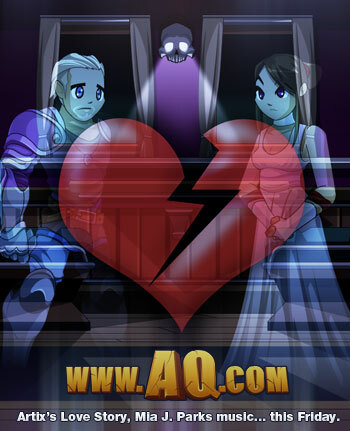 Love's Eternal Curse... affects the AQW team! The curse affecting the characters in this release did not stay in-game! We're all feeling it's effects as it tries to keep us from releasing! Between people being sick, files not working as they should, and Flashing continually crashing (TEN times in under an hour! )*, the curse that's keeping true lovers apart... is also keeping us from release! We'll battle on towards an unbroken release (and unbroken hearts! ), and we'll see you all tonight! * Now 12 Flash crashes! Before voice acting, we do our best to warm up by getting into the spirit of our characters. Apparently Mia does too... 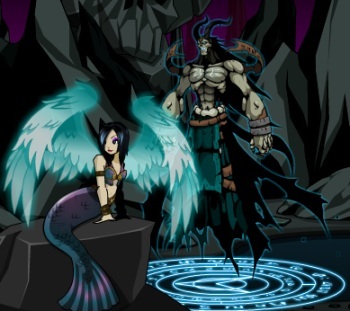 BUT in honor of the AQW Valentine's event, she actually had a makeup artist do her makeup as a mermaid, put on a pretty dress and went into the water! Now THAT is how you do authentic voice acting! Fortunately a mer-photographer took these goergous pictures... because... "Screenshot or it did not happen!" 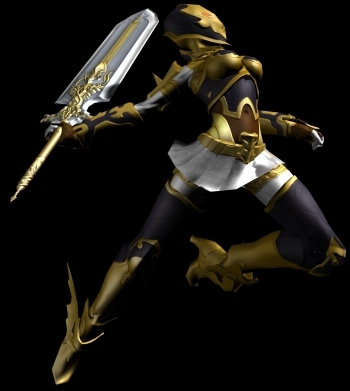 This is so exciting -- we are all anxious to hear her in the game's release tomorrow. Technology Tell did a nice article on Mia and the AQWorlds Valentines Event -- and released some secret info I managed not to leak. Working with Mia has a been fun but also tricky - she lives in Australia, which is both home to many of our awesome players, and pretty much on the exact opposite side of the world from us. But thanks to the power of the interwebs and our gamer-inspired sleep schedules, that did not present a real problem, LOL. 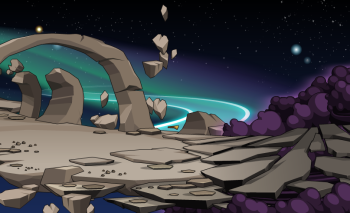 Meanwhile, here at the lab, the entire AQWorlds team is in super crunch time. With less than 24 hours left till the release, we still have a ton of cutscenes, coding, art and animations to complete. This was a REALLY big Valentines day release to attempt to crete in only a week... but look at the bright side, at least this is not going to be a pink/heart/lovey/overly-cutified release like other Valentines Day releases. Nope... 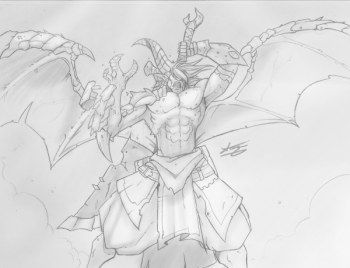 I wrote this story for you guys.... and as a teaser, above is tomorrow's BOSS MONSTER (Drawn by Dage) I really hope you enjoy tomorrow's Valentine's release. P.S. For those of you following the AQ3D / EbilCorp Events, which has been attracting major attention from our fans, something BIG is going down late tonight. Get caught up and find out the results... however this turns out... tomorrow! Artix's Love Story.... this FRIDAY! Most of the things I write about are ghouls, gasts, and creatures of unspeakable darkness. So, the special love story I wrote for your Valentines Day release this Friday has me a little nervous. This is a unusual departure from the way we normally do things, and I suspect the ending will be controversial. There is something that I did not like in the real world... and I intend to change it in ours! Alina & Rolith read the script and occasionally burst out laughing. (But NOT at my boss monster.) I am VERY anxious to see what you think this Friday. 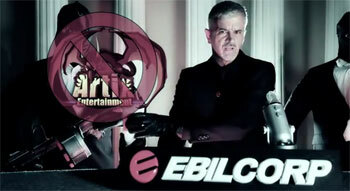 EBILCORP - A Name you can (NOT) trust. OMG! Have you been following this story!? As previously posted, AE has been building a 3D video game (AQWorlds/HeroSmash members are to be invited to the first phase of the Alpha and Beta.) Last Friday, EbilCorp drones broke into AE's Secret Underground Lab and stole all of the 3D files and the classified game-server super computer couch (USB powered). In an act of arrogance, Chairman Platinum, the head of EbilCorp, blatantly posted the entire AdventureQuest 3D website right on the EbilCorp.com homepage, and claimed it was theirs. They did not even bother to change the website url's on the graphics -- they just crossed Artix's name off of the posts. Today, Chairman Platinum made a shocking video post. See for yourself! The AE team is not taking this lying down. Based on news in the newest video, Artix and all of his friends on Twitter are planning a course of action. Please do join in! The Superbowl Halftime Shop is BACK! It's the biggest American Football game of the year. The New York Giants are facing off against the New England patriots and it's time for the halftime show. When you've had your fill of watching madonna do her thing on stage... head to Battleon and look for the button labled PUNT! 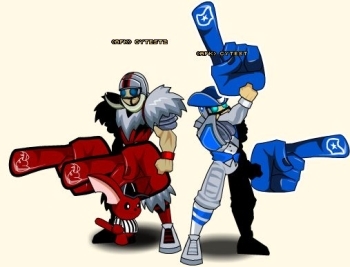 Come join the PUNT map to celebrate this day and these two super-teams with the Mammoth and Loyalist armors and the return of other seasonal favorites like the Spiked Pigskin and the Moglin Ref pet! Don't forget that this is the ONLY time of year that you will be able to get the Moglin Punter Character Page Achievement Badge and all you have to do kis kick Twilly the full 100 yards! The Last Element is NOT the Last Chapter! Desoloth, the Final, finds this amusing.You've even brought a new toy for him to play with... The Proto-Prime of Earth, Arradia! This week you will not just hear them sing, you will need to focus, and burn their song into your mind and replay it! There is also a brand new Etherstorm Earth Rep Shop with new reputation items for you to enjoy! Etherstorm is drawing to a close, but it might not be the ending you would like. And the highly anticipated transforming armor from Dage... the Exosuit Binoku which transforms (for you, not those around you) when you click on it. There are SEVERAL parts to the set and each one has more than one transformation depending on where and how many times you click it. Will you be the first to find every transformation?! This is all the same armor and helm. Seperate weapons. Ready for the SUPERBOWL?! This Sunday is the biggest American Football game of the year... the showdown between the New York Giants and the New England patriots. To celebrate, during the Superbowl's Half-Time Show we will be opening up the PUNT map so you can see how far YOU can kick Twilly. Reach the full 100 Yards and get an ACHIEVEMENT BADGE! We are also opening the Half-Time shop during the Superbowl's Half-Time where you can show support for YOUR favorite team, the Mammoths or the Loyalists! Mia agreed to be in my Valentines Day love story! As previous posted on the soon to dissapear secret AQ3D site, I was surfing YouTube after the ArcAttack event in Doomwood and stumbled on this amazing girl's music. When I heard her beautiful voice it shocked me that her video had less than 100 views. I thought... maybe you guys could help her out with that problem? I liked her music so much that I bought one of her CDs from her website and contacted her about doing the music for love story that I am writing for AQWorlds... which she agreed too... and I just finished the script for 5 minutes ago... and is coming to AQWorlds NEXT week! Anyone else remember when I stated that I was writing a love story and Alina was chuckling because I confidently boasted my story would turn her eyes into waterfalls and "not have zombies"? Well... there will not be any zombies. Nope! *coughs* Ghosts. *coughs* But no zombies! Because I found a far terrifying monster for my love story than any zombie. But you will have to see that with your own eyes! I think the ending is going to be a bit controversial... you will be the final judge if it is beautiful, clever, or a heart felt trainwreck. I got a really cool out-of-the-blue message from Kimberly of One-Eyed Doll that gave us kudos and cheers for spotlighting a very fresh, new, indie artist like Mia. When I found out that Kimberly had even posted on Mia's facebook fan page I felt this.. I do not know what to call it... a "warm feeling of community and belonging." It is so cool that whether you are a player, artist, programmer or a special guest... we all stick around and want to help each other. There is something special in what we have here. Hodan Cornelis Is The Last Of The Cornelis Line! He has wandered the face of Lore for years and has returned to reclaim his family's ancestral home from roving gargoyles and twisted Chaos magic! He needs you help to find his family vault hidden in the maze-like ruins of the once great city of Cornelis. Until he has the Cornelis Title which proves he is the last true heir to Cornelis, he can do nothing to restore his home. Defeat the invaing Gargoyles, defend the city, uncover the vault's secret location (with a little help from yours truly) and solve the RuneSweeper puzzle to unlock the treasures of the Cornelis Family Vault! This Mid-week release also comes with a Member Only Character Page Badge for unlocking the treasure chest within the Cornelis Vault! Thanks to everyone on the forums for your fresh ideas about the Mid-Week Reward Systems! PS: MEMBERS - your two FREE Treausure Chest keys are available once you do your monthly quest to get them! We will, we will ROCK YOU with this earth-shakingly awesome armor by Dage! The Exosuit Binsoku will transform at your command; all you need to do is click the part of the armor you wish to change! Exosuit Binsoku: For hard-headed heroes and hard-hearted villains! We'll have many more items in Quibble stock, too! Make sure you don't miss Quibble Coinbiter's bevy of elementally excellent items in this Etherstorm edition of his time-traveling shop!